It's Week 3 and the ol' Best Of is here to help you find your way through a busy day -- with the stuff that is simply the best of all the stuff. Better than all the rest, you might even say. As always, we'll be updating all day Saturday, so keep us in your open tabs or recent apps or whatever. Country artist Pat Green showed up to contribute to the Iowa Wave and joined both the Iowa and Northern Iowa bands in played his hit "Wave On Wave" at halftime. Last season, Syracuse coach Dino Babers gave an incredible locker-room speech after the Orange upset No. 2 Clemson. Today, after beating Florida State for the first time since 1966, he brought it again. Teachers don't get enough credit as it is, so let us take this opportunity to thank this one for her dedication to her students and her team. Up 3 points with three timeouts and 41 seconds left, BYU coach Kalani Sitake decided to go all in, calling timeout twice to ice Wisconsin senior kicker Rafael Gaglianone. It worked. Kansas stomped Rutgers 55-14, winning its second straight FBS game for the first time since the 2008 season. The Jayhawks rushed for 400 yards, intercepted three Rutgers passes and recovered three fumbles. And now the fans are feeling it. A Gruden sighting in Knoxville! That'd be DJ Mike Gruden, son of Oakland Raiders coach Jon Gruden, oft-rumored to be the future Tennessee coach. According to his LinkedIn profile, Mike is expected to graduate next year from Tennessee with a degree in Business Marketing. In the meantime, here he is DJing for Tennessee fans before the Vols' 24-0 win over UTEP. And as per is customary, here's his Soundcloud. Georgia Southern found one way to move the ball against the vaunted Clemson defensive line in a 38-7 loss. C.J. Wright, a 6-0, 290-pound freshman nose tackle, had 20 yards on five carries for the Eagles. It wasn't Wright's first time carrying the ball, as he was an all-state running back as a junior in high school in Sylvania, Georgia. Tom Rinaldi and College GameDay look at the hottest trends in sideline gimmicks. Tom Rinaldi defends the Miami Hurricanes as the rightful owners of the turnover chain. We're not quite sure what this giant boombox is for yet, but we're intrigued. We see what you did there, Beavers. As games across the Southeast are canceled, rescheduled or moved due to Florence, the Houston Cougars are repaying the love a year after Harvey flooded their campus and schools across the country pitched in to help them. One year ago the nation helped our city. Now it is our turn. We are asking you to help fill the @UHCougarFB truck Monday with supplies to be sent to the East Coast. The Lane Train is back! Not much more to say. The minitrain with Lane Kiffin's face on it is driving around to get you hyped for Saturday's game against Bethune-Cookman. Get a load of this: FAU likes to say "Owl aboard" the train because they're the Owls and it sounds like "all." Wake Forest wore all black in Thursday night's 41-34 loss to Boston College. Oregon is going with a matte-black helmet on all-black unis with "electric green" numbers and accents. It'll be Utah's 11th annual blackout game for the Utes' big Pac-12 After Dark matchup against No. 10 Washington. Come help @WeberStateU set a world record at the groundbreaking Saturday for the new athletic complex on the north end of Stewart Stadium. Groundbreaking is at 5:00 prior to the 6:00 @weberstatefb kickoff. There are always big stakes on college football Saturdays, but Weber State is talking world records over there in Ogden, Utah. The school is breaking ground on a new football facility an hour before kickoff against South Dakota at Stewart Stadium. And if enough fans show up, they could set the world record for "most people taking part in a groundbreaking ceremony." The current record, according to the Guinness people, is 6,256 for the start of construction for the San Jose Earthquakes' MLS stadium. So Weber State is promising big doings: Every fan "will have a chance to turn some dirt," and the first 6,500 to show up get commemorative mini shovels. The Ogden Standard-Examiner notes that last season's highest attendance was 6,876, for a home playoff game. So they'll need some commitment. But the playoff game also probably didn't even have dirt and tiny shovels. Stop me if you've heard this one before: A coach goes home to his alma mater ... in Michigan ... and becomes known for his attire. Alma College's Jason Couch is in his first season as a college head coach but is already the best-dressed coach in America (take notes, Harbs). 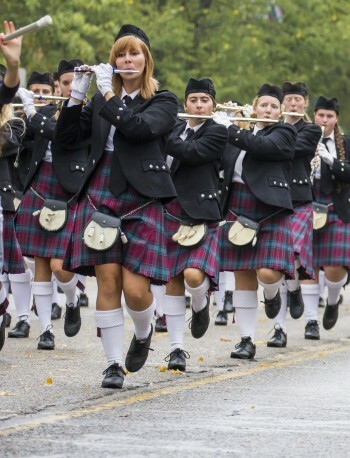 Scottish heritage is a big deal in the city of Alma, Michigan, which calls itself "Scotland, USA." The college has an official Alma College Tartan, which is registered in Aberdeen, Scotland, and worn by the Scots' Kiltie Marching Band, their mascot, Scotty, and Couch, an alum of the school, who pulls it off beautifully. The Scots play at Concordia University Wisconsin on Saturday, so we'll see if Couch rocks the kilt on the road.